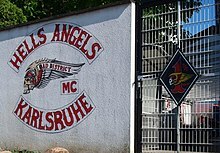 The Hells Angels were formed on March 17, 1948, by the Bishop family World War II veterans in San Bernardino, California followed by an amalgamation of former members from different motorcycle clubs, such as the Pissed Off Bastards of Bloomington. The Hells Angels' website denies the suggestion that any misfit or malcontent troops are connected with the motorcycle club. The website also notes that the name was suggested by Arvid Olsen, an associate of the founders, who had served in the Flying Tigers' "Hell's Angels" squadron in China during World War II. 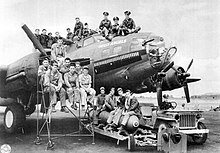 The name "Hell's Angels" was inspired by the typical naming of American squadrons, or other fighting groups, with a fierce, death-defying title in World Wars I and II, e.g., the Flying Tigers (American Volunteer Group) in Burma and China fielded three squadrons of P-40s and the third Squadron was called "Hell's Angels". In 1930, the Howard Hughes film Hell's Angels displayed extraordinary and dangerous feats of aviation, and it is believed that the World War II groups who used that name based it on the film. Some of the early history of the HAMC is not clear, and accounts differ. According to Ralph "Sonny" Barger, founder of the Oakland charter, early charters of the club were founded in San Francisco, Gardena, Fontana, Oakland and elsewhere, with the members usually being unaware that there were other clubs. One of the lesser known clubs existed in North Chino/South Pomona, in the late 1960s. Other sources claim that the Hells Angels in San Francisco were organized in 1953 by Rocky Graves, a Hells Angel member from San Bernardino ("Berdoo") implying that the "Frisco" Hells Angels were very much aware of their forebears. The "Frisco" Hells Angels were reorganized in 1955 with thirteen charter members, Frank Sadilek serving as President, and using the smaller, original logo. The Oakland charter, at the time headed by Barger, used a larger version of the "Death's Head" patch nicknamed the "Barger Larger", which was first used in 1959. It later became the club standard. The club became prominent within, and established its notoriety as part of the 1960s counterculture movement in San Francisco's Haight-Ashbury scene, playing a part at many of the movement's seminal events. Members were directly connected to many of the counterculture's primary leaders, such as Ken Kesey and the Merry Pranksters, Allen Ginsberg, Jerry Garcia and the Grateful Dead, Timothy Leary, The Beatles, The Rolling Stones, Mick Farren and Tom Wolfe. Writing a book about the club launched the career of "Gonzo" journalist Hunter S. Thompson. In 1973, members from several branches of the organization protested at an Environmental Protection Agency hearing about a proposed transportation plan that included restrictions on motorcycle use and sales to get California to meet the new Clean Air Act standards. 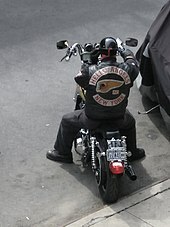 Numerous police and international intelligence agencies classify the Hells Angels as one of the "big four" motorcycle gangs, along with the Pagans, Outlaws, and Bandidos, and contend that members carry out widespread violent crime and organized crime, including drug dealing, trafficking in stolen goods, and extortion, and are involved in prostitution. 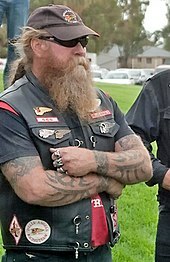 Members of the organization have continuously asserted that they are only a group of motorcycle enthusiasts who have joined to ride motorcycles together, to organize social events such as group road trips, fundraisers, parties, and motorcycle rallies, and that any crimes are the responsibility of the individuals who carried them out and not the club as a whole. The Hells Angels' official website attributes the official "death's head" insignia design to Frank Sadilek, past president of the San Francisco charter. The colors and shape of the early-style jacket emblem (prior to 1953) were copied from the insignias of the 85th Fighter Squadron and the 552nd Medium Bomber Squadron. Red and white are also used to display the number 81 on many patches, as in "Support 81, Route 81". The 8 and 1 stand for the respective positions in the alphabet of H and A. These are used by friends and supporters of the club in deference to club rules, which purport to restrict the wearing of Hells Angels imagery to club members. The diamond-shaped one-percenter patch is also used, displaying '1%' in red on a white background with a red merrowed border. The term one-percenter is said to be a response to the American Motorcyclist Association (AMA) comment on the Hollister incident, to the effect that 99% of motorcyclists were law-abiding citizens and the last 1% were outlaws. The AMA has no record of such a statement to the press, and calls this story apocryphal. Most members wear a rectangular patch (again, white background with red letters and a red merrowed border) identifying their respective charter locations. Another similarly designed patch reads "Hells Angels". When applicable, members of the club wear a patch denoting their position or rank within the organization. The patch is rectangular and, similar to the patches described above, displays a white background with red letters and a red merrowed border. Some examples of the titles used are President, Vice President, Secretary, Treasurer, and Sergeant at Arms. This patch is usually worn above the 'club location' patch. Some members also wear a patch with the initials "AFFA", which stands for "Angels Forever; Forever Angels", referring to their lifelong membership in the biker club (i.e., "once a member, always a member"). In October 2010 the Hells Angels filed a lawsuit against Alexander McQueen for "misusing its trademark winged death heads symbol" in several items from its Autumn/Winter 2010 collection. The lawsuit is also aimed at Saks Fifth Avenue and Zappos.com, which stock the jacquard box dress and knuckle duster ring that bear the symbol, which has been used since at least 1948 and is protected by the U.S. Patent and Trademark Office. A handbag and scarf was also named in lawsuit. The lawyer representing Hells Angels claimed: "This isn't just about money, it's about membership. If you've got one of these rings on, a member might get really upset that you're an impostor." Saks refused to comment, Zappos had no immediate comment and the company's parent company, PPR, could not be reached for comment. The company settled the case with the Hells Angels after agreeing to remove all of the merchandise featuring the logo from sale on their website, stores and concessions and recalling any of the goods that have already been sold and destroying them. In fall 2012 in the United States District Court for the Eastern District of California, Hells Angels sued Toys "R" Us for trademark infringement, unfair competition, and dilution in relation to the sale of yo-yos manufactured by Yomega Corporation, a co-defendant, which allegedly bear the "Death Head" logo. In its complaint, Hells Angels asserted that the mark used on the yo-yos is likely to confuse the public into mistakenly believing that the toys originate with Hells Angels and Yomega filed counterclaims against Hells Angels for cancellation of the "Death Head" registrations on grounds of alleged fraud in the procurement of the registrations. The case settled and the lawsuit was dismissed with prejudice. As of December 2013[update], the Hells Angels sells its branded merchandise at a retail store in Toronto, Canada. To become a full member, the prospect must be voted on unanimously by the rest of the full club members. Prior to votes being cast, a prospect usually travels to every charter in the sponsoring charter's geographic jurisdiction (state/province/territory) and introduces himself to every Full-Patch member. This process allows each voting member to become familiar with the subject and to ask any questions of concern prior to the vote. Some form of formal induction follows, wherein the prospect affirms his loyalty to the club and its members. The final logo patch (top "Hells Angels" rocker) is then awarded at this initiation ceremony. The step of attaining full membership can be referred to as "being patched". The HAMC acknowledges more than a hundred charters spread over 29 countries. The Hells Angels motorcycle club founded a charter in Auckland, New Zealand, in 1961 and has since taken over gangs in Wanganui. New Zealand had the first charter of the Hells Angels outside the United States. Europe did not become widely home to the Hells Angels until 1969 when two London charters were formed. The Beatles' George Harrison invited some members of the HAMC San Francisco to stay at Apple Records in London in 1968. According to Chris O'Dell, only two members showed up at Apple Records, Frisco Pete and Bill "Sweet William" Fritsch. Two people from London visited California, "prospected", and ultimately joined. Two charters were issued on July 30, 1969; one for "South London"—the re-imagined charter renewing the already existing 1950 South London charter—and the other for "East London", but by 1973 the two charters came together as one, called "London". The London Angels provided security at a number of UK Underground festivals including Phun City in 1970 organized by Mick Farren. They awarded Farren an "approval patch" in 1970 for use on his first solo album Mona, which also featured Steve Peregrin Took (who was credited as "Shagrat the Vagrant"). Members of the Spanish Charter were involved in a killing and tried. A list of acknowledged charters can be found on the HAMC's official website. The club claims not to be a racially segregated organization, although at least one charter allegedly requires that a candidate be a white male, and Sonny Barger stated in a BBC interview in 2000 that "The club, as a whole, is not racist but we probably have enough racist members that no black guy is going to get in it". At that time the club had no black members. However, there have been black members of puppet clubs, notably Gregory Wooley, a high-ranking member of the Rockers MC in Montreal who was the protégé and bodyguard of Hells Angel boss Maurice Boucher (who spent five years in a notoriously white-supremacist motorcycle gang, the SS). Wooley became an associate of the Hells Angels Montreal charter in the 1990s and later tried uniting street gangs in Quebec after Boucher was imprisoned. ^ Hopper, C. B., & Moore, J. (1990). Women in outlaw motorcycle gangs. Journal of Contemporary Ethnography, 18(4), p.385. ^ a b "Inside the biker gangs: the truth about guns, drugs and organized crime". The Independent. UK. August 14, 2007. Archived from the original on June 9, 2008. Retrieved August 13, 2010. ^ a b Drewery, George (Spring 2003). "3 Skulls, Wings & Outlaws – Motorcycle Club Insignia & Cultural Identity" (PDF). Inter-Cultural Studies; A Forum on Social Change & Cultural Diversity. 3 (2). p. 29. ISSN 1445-1190. Archived from the original (PDF) on September 6, 2006. ^ "Hells Angels Charters Worldwide". Archived from the original on January 9, 2015. Retrieved December 10, 2014. ^ "Motorcycle gang". U.S. Department of Justice. Archived from the original on April 15, 2014. Retrieved January 23, 2010. ^ Lockyer, Bill (2003). "ORGANIZED CRIME IN CALIFORNIA" (PDF). CALIFORNIA DEPARTMENT OF JUSTICE. Retrieved January 23, 2010. ^ "ORGANIZED CRIME IN OREGON" (PDF). Oregon State Department of Justice. September 2006. Archived from the original (PDF) on July 21, 2011. Retrieved January 23, 2010. ^ "ASIAN ORGANIZED CRIME AND TERRORIST ACTIVITY IN CANADA, 1999–2002" (PDF). Federal Research Division. Library of Congress. July 2003. Retrieved January 23, 2010. ^ "81" is a metonym. As 'H' and 'A' are the 8th and 1st letter of the alphabet. ^ "Hells Angels MC World FAQ". Hells-angels.com. Retrieved March 27, 2012. ^ "Hells Angels vs. Memphis Belle, Historical Information" (PDF). 303rd Bomb Group Association. Retrieved 11 August 2008. ^ "Hels Angels Motorcycle Club World". hells-angels.com. Retrieved November 30, 2014. ^ "Hells Angels MC World". Hells-angels.com. Retrieved February 15, 2011. ^ Rossi, J.R. "Flying Tiger Association Unit Rosters". The Flying Tigers - American Volunteer Group - Chinese Air Force. ^ Bagnall, Sam (January 2, 2004). "Programmes | This World | Hells Angels: Easy-riders or criminal gang?". BBC News. Retrieved August 13, 2010. ^ "The Fall of the Counterculture : Preview". Bu.digication.com. Retrieved 30 November 2014. ^ "Interview with Sonny Barger". Pdr.autono.net. Retrieved 2013-06-18. ^ “Early Implementation of the Clean Air Act of 1970 in California.” EPA Alumni Association. Video, Transcript (see p14). July 12, 2016. ^ "FBI Safe Street Violent Crime Initiative Report Fiscal Year 2000" (PDF). Archived from the original (PDF) on 2001-09-13. Retrieved August 13, 2010. ^ Ibrahim, Youssef M. (March 3, 1997). "New York Times, Sweden's Courteous Police Spoil a Hell's Angels Clubouse Party". New York Times. Stockholm (Sweden); Sweden. Retrieved August 13, 2010. ^ "[Hpn] Hells Angels Mc Salvation Army Shelter Run". Hpn.asu.edu. July 6, 2003. Archived from the original on July 9, 2010. Retrieved August 9, 2010. ^ "Under watchful eye, bikers aid charity – Thursday, Sept. 4, 2008 | midnight". Las Vegas Sun. Retrieved August 9, 2010. ^ a b "History". Hells-angels.com. Archived from the original on 2008-07-14. 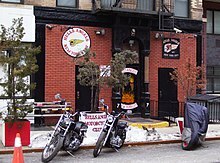 ^ "Hells Angels Motorcycle Club settled disputes the old-fashioned way, with a swift kick in the groin or a punch in the face to the offending party. – Hells Angels". Zimbio. Archived from the original on July 18, 2011. Retrieved February 15, 2011. ^ "Companies / Personal Goods – Hells Angels sue luxury fashion house". Financial Times. October 27, 2010. Retrieved February 15, 2011. ^ zzfritz, Fritz Clapp (October 7, 2009). "Re: Hell's Angels skinpack". FOFO Gaming. Retrieved October 7, 2009. ^ zzfritz, Fritz Clapp (7 October 2009). "Fritz Clapp Tweet". Twitter. Retrieved October 7, 2009. ^ Ella Alexander (October 27, 2010). "Hells Angels sue Alexander McQueen (Vogue.com UK)". Vogue.co.uk. Archived from the original on October 30, 2010. Retrieved February 15, 2011. ^ "Hells Angels set for rumble on the catwalk - Business - Retail". MSNBC. October 27, 2010. Retrieved February 15, 2011. ^ Jeffrey, Don (October 26, 2010). "Hells Angels Sue Saks, McQueen Design, Over Trademark". Bloomberg. Retrieved February 15, 2011. ^ "Grazia Fashion: McQueen Settles with Hells Angels". Graziadaily.co.uk. Retrieved February 15, 2011. ^ Verena von Pfetten (November 3, 2010). "Alexander McQueen – Hell's Angels – SETTLEMENT". Styleite. Retrieved February 15, 2011. ^ Cowles, Charlotte. "Alexander McQueen Settles With Hells Angels by Agreeing to Destroy Merchandise With Skull Logo – The Cut". Nymag.com. Retrieved February 15, 2011. ^ "Attorney for Plaintiff : HELLS ANGELS MOTORCYCLE CORPORATION" (PDF). Archive.org. Retrieved 30 November 2014. ^ Weller, Susan Neuberger (July 12, 2013). "Hells Angels and Toys "R" Us Settle "Death Head" Trademark Litigation". The National Law Review. ^ Weiss, Debra Cassens (3 December 2013). "Hells Angels club sues often to protect its intellectual property". ABA Journal. Retrieved 30 December 2013. ^ Hall, Neal (June 10, 2005). "Behind the Patch: Angels ABCs". The Vancouver Sun. Archived from the original on March 3, 2010. Retrieved August 13, 2010. ^ a b c "Born to raise Hell". BBC News. August 14, 2000. Retrieved February 1, 2013. ^ "George Harrison's memo to Apple staff about the Hell's Angels, 4 December 1968". Beatlesbible.com. 1968-12-04. Retrieved 2013-11-06. ^ Chris O'Dell (2009-10-06). Miss O'Dell: My Hard Days and Long Nights with The Beatles, The Stones, Bob Dylan, Eric Clapton, and the Women They Loved. p. 68. ISBN 1416590935. ^ "Hells Angels MC London History". Archived from the original on 2009-05-09. ^ "Biker gangs in Canada". Cbc.ca. July 13, 2011. Retrieved November 30, 2014. ^ "Hells Angels MC World". Hells-angels.com. Archived from the original on January 9, 2015. Retrieved February 15, 2011. ^ Johnson Publishing Company (December 1966). "Nazi Emblems of 'Way Outs' Are No Symbols of Hate". Ebony. p. 70. ISSN 0012-9011. ^ 2003 Soul on Bikes: The East Bay Dragons MC and Black Biker Set, Tobie Gene Levingston, with Keith and Kent Zimmerman (St. Paul, MN: Motorbikes International Publishing). The history of the Oakland-based African-American Motorcycle Club with a foreword from Sonny Barger. ^ Wright, Gary L. (June 8, 2012). "FBI leads crackdown on area Hells Angels gangs in N.C. and S.C." Winston-Salem Journal. Archived from the original on July 28, 2014. Retrieved June 18, 2013. ^ Eric Thibault (August 16, 2012). "Sun News : Dead gang leader rebuffed top biker prior to assassination: Source". Sunnewsnetwork.ca. Archived from the original on January 7, 2013. Retrieved June 18, 2013. ^ "Montreal police try to calm mafia war fears after multiple killings". Global Montreal. Archived from the original on March 23, 2013. Retrieved June 18, 2013. ^ Giuseppe Valiante. "Sun News : Bust shows connections in criminal underworld in Canada". Sunnewsnetwork.ca. Archived from the original on November 3, 2012. Retrieved June 18, 2013. ^ a b "Sonny Barger Interview". Let Them Talk. Retrieved 2013-06-18. ^ "Soul on Bikes: Tobie Levingston: 9780760317471: Amazon.com: Books". Amazon.com. Retrieved 2013-06-18. ^ a b Johnson Publishing Company (December 1966). "Nazi Emblems of 'Way Outs' Are No Symbols of Hate". Ebony. p. 66. ISSN 0012-9011. ^ "Chosen Few Motorcycle Club - Buffalo, NY". Chosenfewbuffalony.com. Archived from the original on May 25, 2013. Retrieved June 18, 2013. Carter F. Smith (2017). Gangs and the Military: Gangsters, Bikers, and Terrorists with Military Training. Rowman & Littlefield. This page was last edited on 7 April 2019, at 03:56 (UTC).